His Highness Sheikh Mohamed bin Zayed Al Nahyan, Crown Prince of Abu Dhabi and Deputy Supreme Commander of the UAE Armed Forces, received at Al Bahr Palace, participants in the 12th forum organised by the Ministry of Foreign Affairs and International Cooperation for UAE Ambassadors in the fraternal and friendly countries, heads of diplomatic missions and representatives the international organisations abroad. Sheikh Abdullah bin Zayed Al Nahyan, Minister of Foreign Affairs and International Cooperation, and Dr. Anwar bin Mohammed Gargash, Minister of State for Foreign Affairs, attended the meeting. Sheikh Mohamed praised "our ambassadors and all the country's representatives abroad" as being "an important part of the UAE's successful story. They represent a liaison point between the UAE and countries of the world. With their capabilities and enlightened thinking, we will be able to achieve the desired effect to build strong bonds between our people and the world." "I appreciate the tiredness, hardwork and the pain of being away from the home country, but you are rewarded for representing your country and highlighting its role and position as well as reflecting the good image of your people and your country. Your country has become a role model in the region, thanks to the stability, advanced infrastructure and robust economy granted by Allah the Almighty. This brings happiness to us and adds huge and double responsibility towards our country to enhance its development and progress," Sheikh Mohamed added. In a tweet he said "receiving the country's ambassadors abroad and emphasised their active role in strengthening ties with allies and friends." Sheikh Mohamed reiterated, " The achievements accomplished by the country is the fruit of 50 years of relentless efforts exerted by your fathers and grandfathers, and we have to put on more joint efforts to double the accomplishments in the coming 30 years." "The percentage of our political concentration in our relations with other countries is a small while the largest proportion is in consolidating bridges of co-operation, improving economic co-operation, increasing trade exchange, promoting the cultural, social and tourism co-operation, bringing together viewpoints as well as spreading Emirati peace values. Therefore, the ceiling of our expectations for your efforts in the diplomatic field is high during the coming period as you represent the elite of diplomatic work," Sheikh Mohamed noted. Sheikh Mohamed said, "The UAE was built up on solid pillars of noble values by the late Sheikh Zayed bin Sultan Al Nahyan which aimed at spreading the culture of giving, tolerance and coexistence as well as other human values and helping the underprivileged. Our duty is to reflect this image, materialize it in our behaviour and responsibilities each in his field." "The UAE has won trust of the world and gained international reputation thanks to its balanced, open foreign policy and following in the step of Zayed's policy for building close, strong relations. 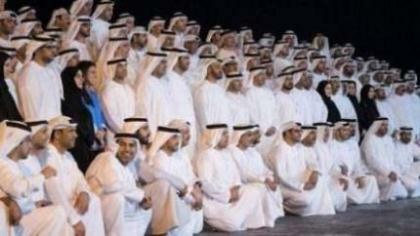 You are today representing the UAE and you are the best to do that and your efforts are commendable and appreciated. However, we are seeking through you more diplomatic dynamism and work in order to strengthen our ties with other countries not only politically, but also in other spheres so as to entrench the UAE's standing and its leadership as well as its aspirations to join the club of advanced nations," stated Sheikh Mohamed bin Zayed. Sheikh Mohamed emphasised the importance of investing time in building constructive, close international partnerships. Countries that maintain strong political, developmental and economic relations, and humanitarian relations before that are those which win respect and appreciation of the world," Sheikh Mohamed said. The Crown Prince of Abu Dhabi applauded the efforts being made by the Ministry of Foreign Affairs and International Cooperation to deliver the interests of the state and its citizens internationally. The ambassadors' forum, he added, seeks to crystalise future objectives, assess mechanisms of work and propose constructive, innovative ideas to develop the ministry's work. Sheikh Mohamed spoke about the UAE's role in countering terrorism and extremism since the September terrorist attacks and his pre-emptive vision to confront these terrorist groups as well as their sources of funding and platforms supporting them. Sheikh Mohamed noted with pride to the sacrifices and brave stances taken by the UAE people in battles of duty, dignity and humanitarian fields. "You are also soldiers and you have responsibilities, duties and a message to carry in the service of your homeland abroad," he said. For their part, the ambassadors expressed their delight at meeting His Highness and paid tribute for the close follow up and care shown by the country's leadership in providing UAE diplomats with all factors of success so as to deliver their message and perform their national duty in serving the state's interests and bolster its ties of friendship and cooperation with other countries and peoples.